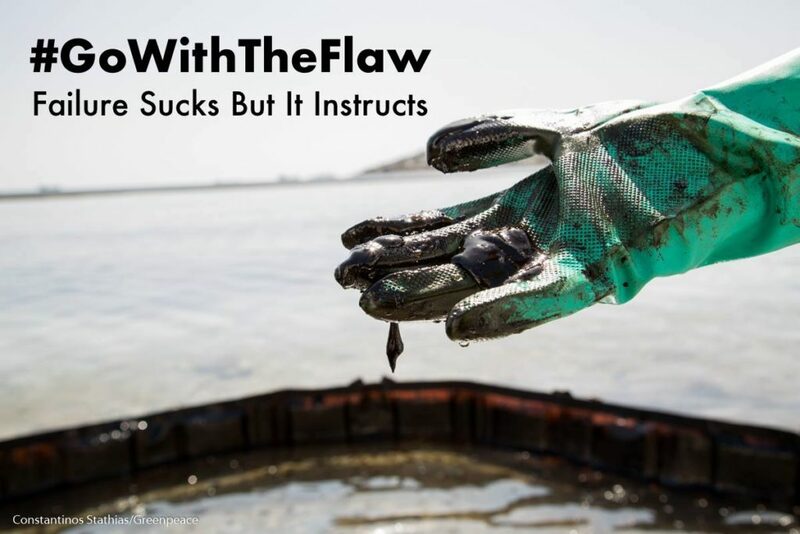 Go With the Flaw is an initiative we started this year to proudly state that ‘it’s perfectly okay to screw up, just try to learn from it’ both to our grantees and fellow funders. You can read a bit more about our reasoning around failure here. 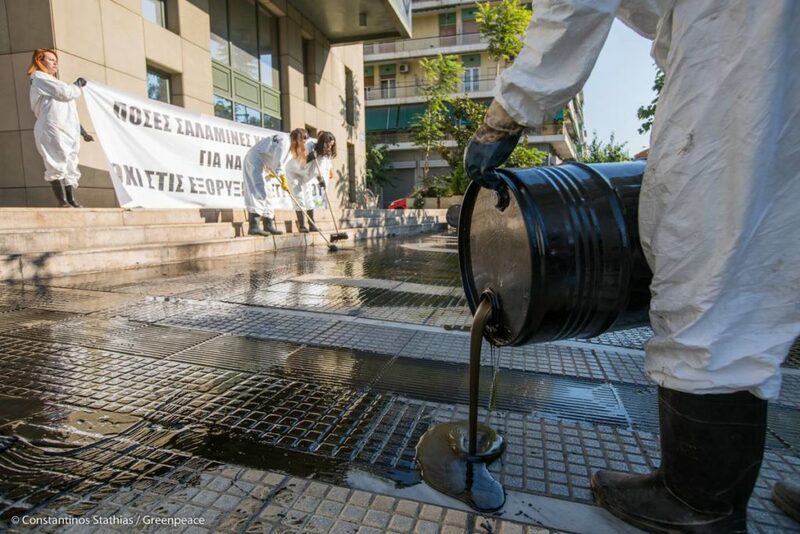 Late last year we supported the creation of a fake oil spill on the doorsteps of the Ministry of the Environment & Energy in Athens, a direct action coordinated by Greenpeace Greece in response to state inaction, incompetence and failure to afterwards take proper steps to address their inaction and incompetence with regards to the oil spill in the Argosaronic Gulf in September 2017 (more info on this grant here). In fact, this direct action was not coordinated by Greenpeace, it was carried out by Greenpeace and Greenpeace alone. That was not what we had initially planned. Salamina Island was the place most hurt by the oil spill from the tanker Agia Zoni. Beaches had to shut down and coastal businesses such as restaurants and hotels, most small or medium sized enterprises, were immediately hurt. The government action was deemed slow, incompetent, and compensation towards these people did not seem to be anyone’s concern, not to mention conservation efforts for the environmental damages caused. Greenpeace was on the scene immediately, helping people organise the beach clean-ups and of course many conversations were had and local outrage and disappointment was evident. The conversation quickly shifted to what can be done to hold the government accountable and demand action. In true Greenpeace fashion, creating something visually arresting to spark a conversation and get media attention was step one, i.e. the creation of the oil spill in front of the Ministry in the capital. Step two was showing up in numbers and making the demands loud and clear; compensation to affected locals, efforts to reduce environmental damage, and more long-term commitments to shift away from fossil fuels, that are clearly a harmful energy source and push for investment in renewables. The crowd would have to be made up of locals. 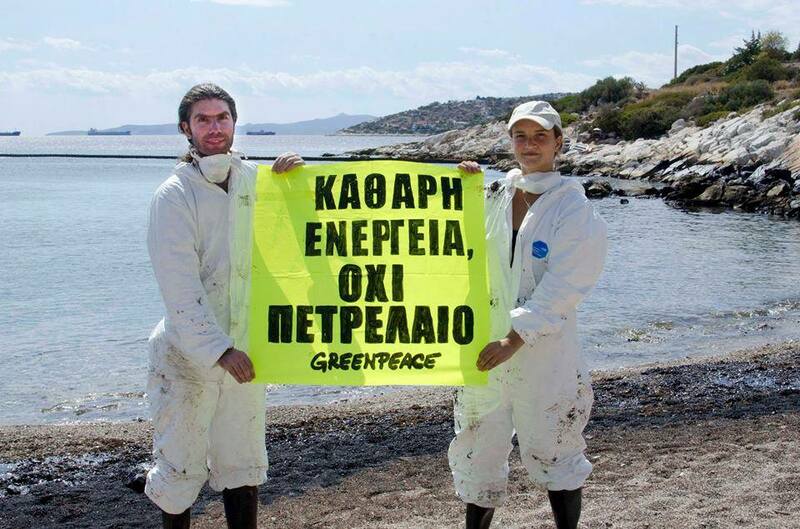 From Salamina, from Piraeus, from coastal municipalities of Athens and Greenpeace would just help with coordination, banners etc. When the eve of the action came, the locals got cold feet. They wouldn’t budge. Various reasons came in. It might be a bad move because it might mean they would then definitely not get compensated if they stood up to the government. Some were too busy. Some were just no longer up for it. Bottom line is, community engagement dropped to zero overnight and Greenpeace activists were left solo. They quickly checked with us (via Telegram) if it was okay to go ahead with the action even though they’d be doing it alone (yes we use Telegram and Signal and Whatsapp with our grantees). We of course gave them the thumbs up and the action went ahead, was great, but the numbers were not there, the community didn’t stand up for itself. Greenpeacers holding up a banner that says ‘Clean Energy, Not Petroleum’. If the culture of activism in a place is not mature and people are not used to taking part in direct action you cannot rush them. There’s a chance they wont take part in your march or demonstration even if they said they would. Also, sometimes they have legitimate reasons, so you have to really make sure they understand the stakes. Greece is an interesting case study, because there is a culture of demonstrations, the national indignados movement, sanitation, union workers strikes, farmer tractor marches, but divestment from fossil fuels or government accountability for ecological disasters does not really go hand in hand with Greek activism so widening the issue areas of mobilisation is the work in progress. Sometimes you have to go it alone, and it is better than nothing. For every crazy solo activist, or fringe group that appears on social media or the papers, one or two people might be swayed to come join in the next time. It is not the most efficient means of recruitment but it can sometimes quickly snowball. 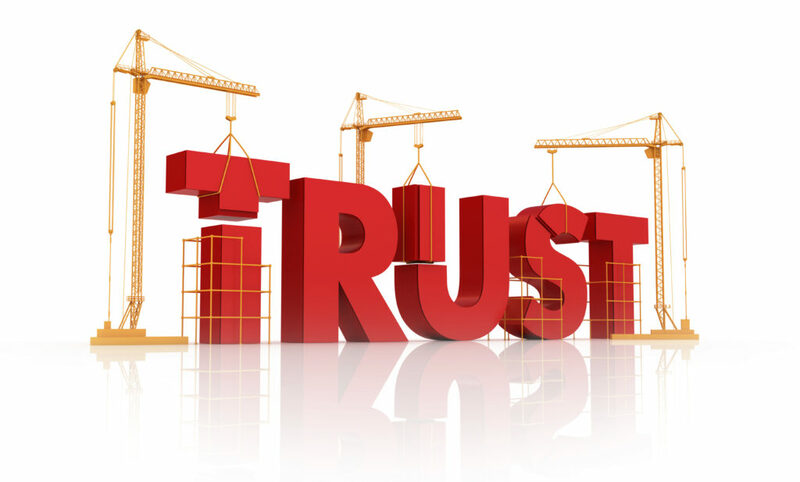 Trust your grantees. It was super appreciated that Greenpeace got in touch with us to check whether they should do the direct action solo even if plans changed, but they shouldn’t have. We decided to give a grant which means that we trust that they’ll do what’s right. They know the local context better than we do and if they deem a not-community-backed action is better than no action then so do we. But they’re also primed to cross check everything to keep funders happy and avoid stepping on anyone’s toes which is generally the culture funders create.